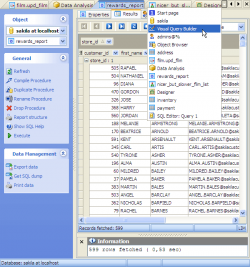 Database Designer allows you to create physical ER Diagram that will represent objects in your MySQL database. 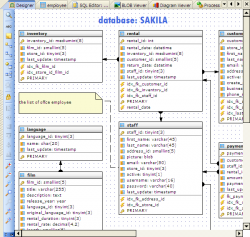 A diagram represents the tables of your database and the relationships between them. The tool is intended for reverse engineering and database modification in an easy and powerful way. It helps you to simplify database maintenance. You can add an existing MySQL table to the diagram using popup menu in the working area, or with the corresponding link on the Navigation bar. 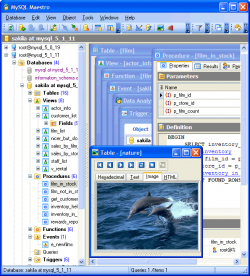 Tables also may be dragged on the diagram from Explorer and the similar to Explorer tools like Object Manager and Object Browser. All the diagram objects are available for editing. Just double click the object (table or relationship) to view/edit its properties within the corresponding editor. Along to reverse engineering the tool allows you to apply best fit to the diagram. You can also see the print preview of the diagram. Easy and clear features allows you to adjust the scale of the diagram and the position of the visible part. 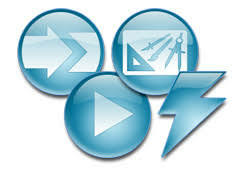 Move, Hand, Zoom tools with a set of shortcuts and a toolset for aligning are also available. 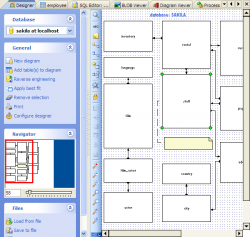 Besides the Database Designer allows you to Load a diagram from file, Save to file, and Save as image (Bitmap, GIF and JPEG formats are supported). All the ER Diagram elements are customizable. You can set table height option to resent it on the diagram as caption only, key fields, etc. You can enable showing of the grid and snap to grid function. Then diagram will be covered by points disposed on the same interval between and when you will move the table or other object, its upper left corner "snaps" to the nearest grid point. Interval between grid points can be changed. The Colors options are to attune the Designer appearance to your taste. I've used Maestro about 5 years. I like it very much. Simple and pretty.